The 4th annual Spokane Oktoberfest, a community celebration of all things Bavarian is this Friday, September 28 through Sunday, September 30 Spokane Valley's CenterPlace. German music, food, beer, and a variety of fun events for the whole family. Hours are Friday 4-11pm, Saturday noon-11pm and Sunday 11am-5pm. Daily adult admission $10; All Event Pass $15. Family Day Sunday 1/2 price courtesy of the Spokesman-Review. Children 12 or younger are free during the entire event. At 9pm it turns to 21+. A portion of this year's Spokane Oktoberfest proceeds will go towards supporting the mission of the Wishing Star Foundation. For tickets and more information, visit spokaneoktoberfest.com. This year's Summer Concert Series at Arbor Crest Wine Cellars is winding down, with just two remaining outdoor concerts. This Thursday, September 27, it's Harvey Stanley performing classic folk-rock at the Tasting Room Stage. Music runs from 4:30-6:30, $5 admission. And this Sunday, September 30 from 4:30-7pm, enjoy the music of Common Ground, performing classic rock hits. $10 admission. And in case you're wanting more music at Arbor Crest, beginning next week, their popular Fireside Music Series begins, on Fridays and Saturdays throughout the fall and winter seasons. 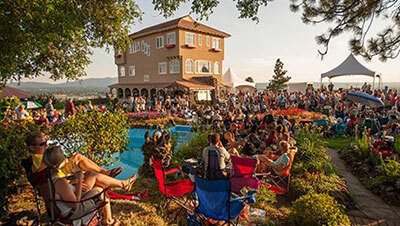 Live music is performed at their Tasting Room, and typically runs from 5:30-7:30. Stay tuned for next week's music at Arbor Crest! For more details, visit arborcrest.com. The 29th Annual Valleyfest was a big success! Thanks to all the great sponsors of this wonderful family event: MultiCare Valley Hospital, Modern Electric Water Company, City of Spokane Valley, Inland Empire Paper Company, Spokane Transit, Fleet Feet Sports, Spokane Valley Mall, The Current, INLANDER, Umpqua Bank, ambetter from Coordinated Care, Waster Management, Sunshine Disposal and Recycling, Pinecroft Business Park, BECU, Spokane International Airport, Washington Trust Bank, Dishman Dodge, Banner Bank, Spokane Valley Partners, Washington State Arts Commission, Anderson & Peretti & co., Cabela's, Delta Dental, Fred Meyer, Horizon Credit Union, Molina Health Care, Yoke's Fresh Market, Avista, The Bike Hub, Dave's Bar and Grill, KIND Snacks, and the YMCA. Spokane native and celebrated comedienne, actor, writer and Saturday Night Live star Julia Sweeney comes home to the Fox this Friday, September 28 with her show, Older and Wider. Performance begins at 8pm. Go to www.foxtheaterspokane.org for your seats. Beyond Pink is October 6! Beyond Pink, a local non-profit and 501(c)3, is hosting their 9th annual designer Bra Fashion Show next Saturday, October 6, at The Davenport Grand Hotel from 5:30-10pm. At 5pm, the doors will open to a fabulous silent auction with hundreds of items, no host bar and plentiful hors d'oeuvres. At 7pm the live show and auction will begin. Talented local artists and designers will once again show off their best. Their themed packages will be auctioned off one by one as the fun evening continues. The event will wrap up with a very fun after party where all are invited. Hundreds will turn out to support Beyond Pink - and 100% of the net proceeds will go towards funding for women who cannot afford thermography. To date, the charity has helped over 1,250 local women in the battle against breast disease, a number not lost on those behind this event's success. The last event raised over $188,000, which will now go directly to help women in our community. Go to beyondpink.net for more information and tickets. Get ready for high-energy music made with pots, pans, power tools, car parts, ladders - everything including the kitchen sink. The four-man team delivers a wild all-ages show featuring percussion instruments made up of stuff you're more likely to find at a junkyard than in a band room. Combining heavy metal, punk, pop and hip-hop, Recycled Percussion delivers an exciting interactive music experience. Showtime is the Saturday, September 29 at 7pm. Tickets available at www.foxtheaterspokane.org, TicketsWest outlets. 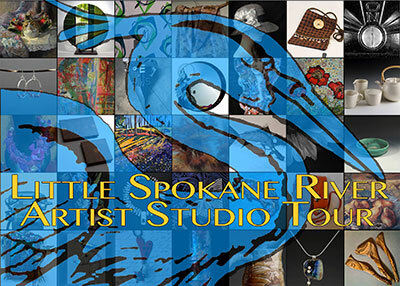 The 11th Annual Little Spokane River Artist Studio Tour opens at 10am this Saturday, September 29 with 41 artists divided between 5 studios. Original works in all mediums are for sale. Go to LittleSpokaneStudio.com for a downloadable driving map with directions. 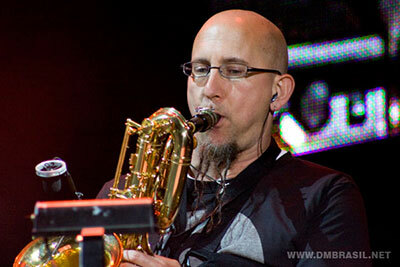 The Spokane Jazz Orchestra, with Jeff Coffin, three-time Grammy winning saxophonist with the Dave Mathews Band, is at the Bing Crosby Theater this Saturday, September 29 at 7:30pm. Spokane Preservation Advocates will present four of Spokane's most beautiful, turn-of-the-century historic homes built in the early 1900's around Corbin Park on Sunday, September 30 from noon-4pm. Attendees are invited to enjoy Corbin Park, the site for one of Spokane's earliest race tracks, and to tour landmark-quality homes. Learn about the homes style, architect/builder, former home-owners and residents, furnishings/antiques/artwork, and the surrounding neighborhood. All of the houses face Corbin Park and reveal original designs, materials, and workmanship from the early 1900's. The cost is $20 at the tour or online at SpokanePreservation.org. Ramada by Wyndham at Spokane Airport has launched a new menu in Remington's Restaurant. Chef Katie Freeman has created a fusion menu which includes a new twist on a lot of old favorites. The menu features a variety of selections including 'tastes and bites', 'cold bar', 'hand helds', 'build your own' and 'after five table plates' which allows the customer to take more control over the portion sizes and price of the meal they wish to order. The dessert selection includes Remington's new signature smore's cookie served with a shot of milk to commemorate the new alfresco dining space and fire pits recently added to the courtyard.